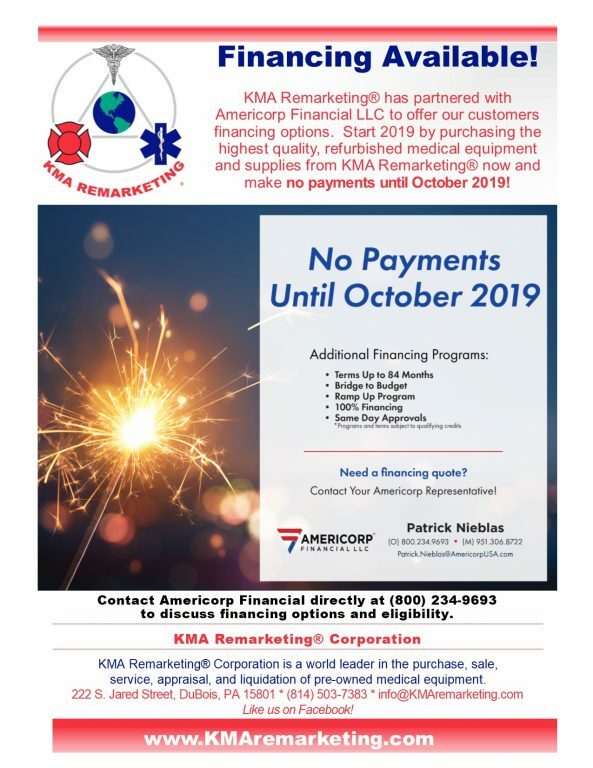 KMA Remarketing® offers equipment in various classifications such as pre-owned, as-is, refurbished, and patient ready. We offer sales to other dealers, individual doctors, hospitals, and surgery centers, both domestic and international. We have an online store, an auction site, an eBay store, and a DOTmed site. The sale of certain items may be subject to regulation by the U.S. Food and Drug Administration and state and local regulatory agencies. Please complete the FDA Form and return it to us for verification as an authorized purchaser. For all items being shipped internationally, a BIS_711 form will also need to be completed and submitted for verification. International buyers are responsible for all tariffs, taxes, duties, etc. New Distributor Products: New with manufacturer’s warranty. Pre-Owned, Unused: Equipment was never used or put into service. Equipment will be in “like new” condition. Pre-Owned, Reconditioned, Patient Ready: Equipment is being sold as having been tested, calibrated, and bio-medically certified. Cosmetic work has been done to the unit. No warranty unless noted. Will include copy of Biomedical Report. Pre-Owned, Patient-Ready: Equipment is being sold as having been tested, calibrated, and bio-medically certified. No cosmetic work done to the unit. No warranty unless noted. Will include copy of Biomedical Report. Pre-Owned, As-Is, Powers On: Equipment is being sold “As-Is – Powers On.” No warranty expressed or implied other than the equipment is guaranteed to power on. The equipment has not been calibrated or tested for proper functionality. Pre-owned, As-Is: Equipment is being sold “As Is.” No warranty expressed or implied. No guarantee of functionality.